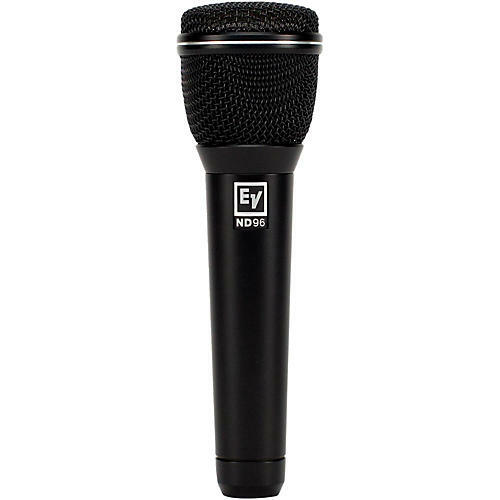 The Electro-Voice ND96 dynamic supercardioid vocal microphone features exceptionally high gain before feedback that is extremely effective on loud stages. Its shock-mounted capsule minimizes handling noise, which helps to eliminate low-frequency bumps and thumps from reaching the PA. Use the ND96 with confidence near speaker cabinets and EMF-generating equipment racks thanks to its Humbucking coil that helps guard the mic against line hum. The Memraflex grille is a durable tight-mesh deigned to withstand extraordinarily rough treatment from the road and consistent use. ND96’s structural and acoustical functions allow the mic’s signal to be pushed through an incredibly loud ambient volume without risking feedback, and its selectable voice presence booster reduces certain low-mid frequency areas and emphasizes key upper-midrange vocal presence areas for a more profound vocal edge when driving the voice higher in the mix.